As I settle into my job as instructional coach in a new school district this year, I am still orienting myself to my surroundings. I believe I have finally located all of the staff bathrooms, and I have found both copy machines. I have a pretty firm layout of the two-story building and if you came to visit me, I could probably take you on a guided tour without getting us lost. I have noticed the classrooms are all carpeted (rather than tiled) which makes every room feel like my living room. I am still acclimating myself to the ever-present technology. Chromebooks, iPads, and green screens are everywhere. 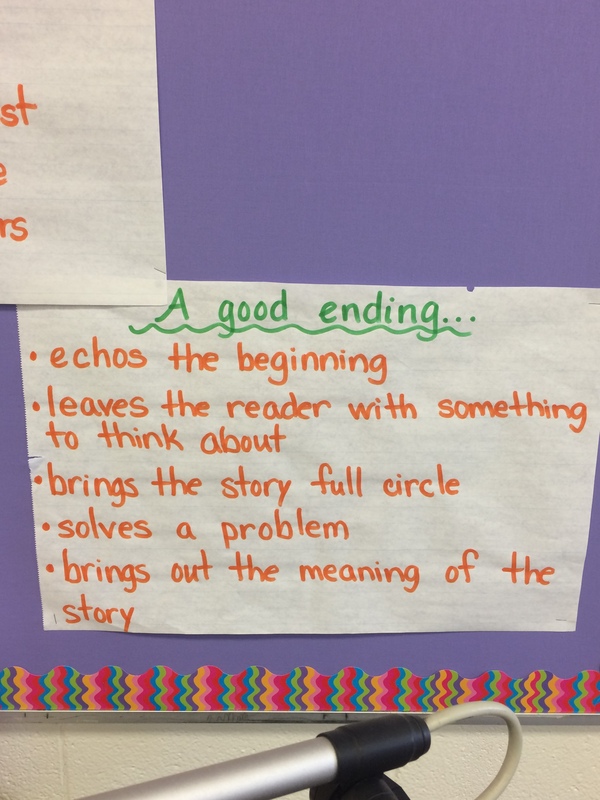 This chart is from a first grade classroom. They are just beginning their information writing unit. This may be my favorite chart. 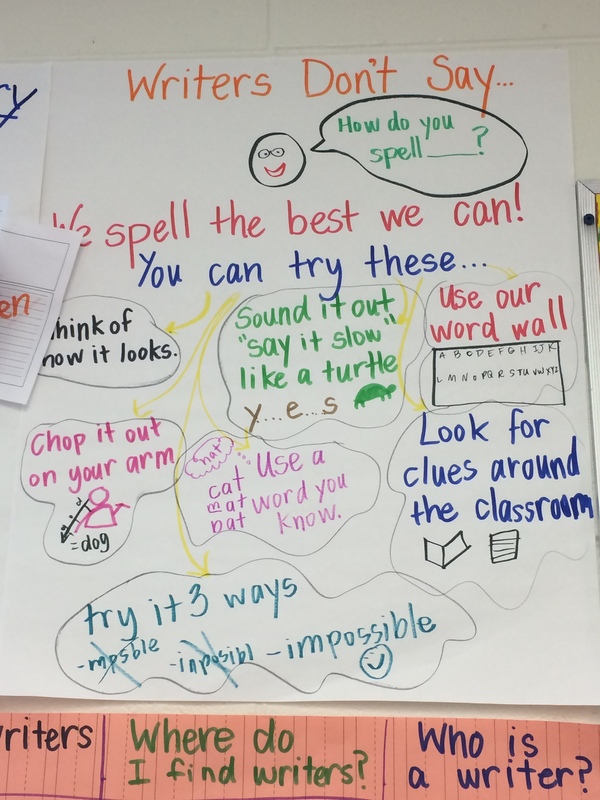 Look at all those spelling strategies! 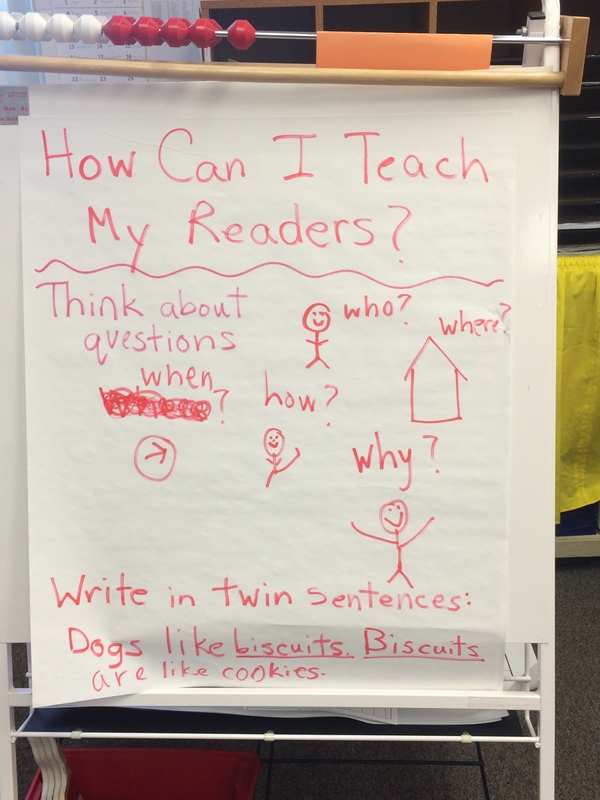 What I love about this chart is the advice to “write in twin sentences.” This chart is also from a first grade classroom. 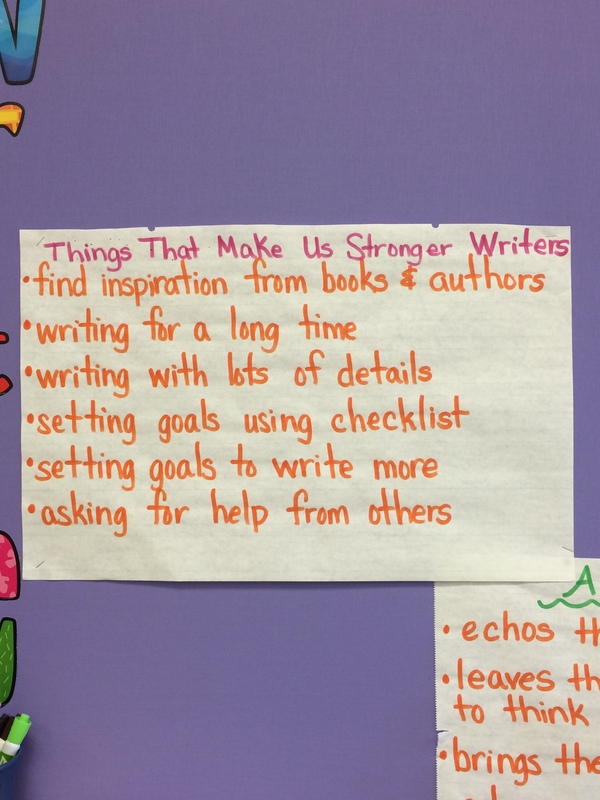 These kids are working to be stronger writers. There are several options here for writing a good ending. 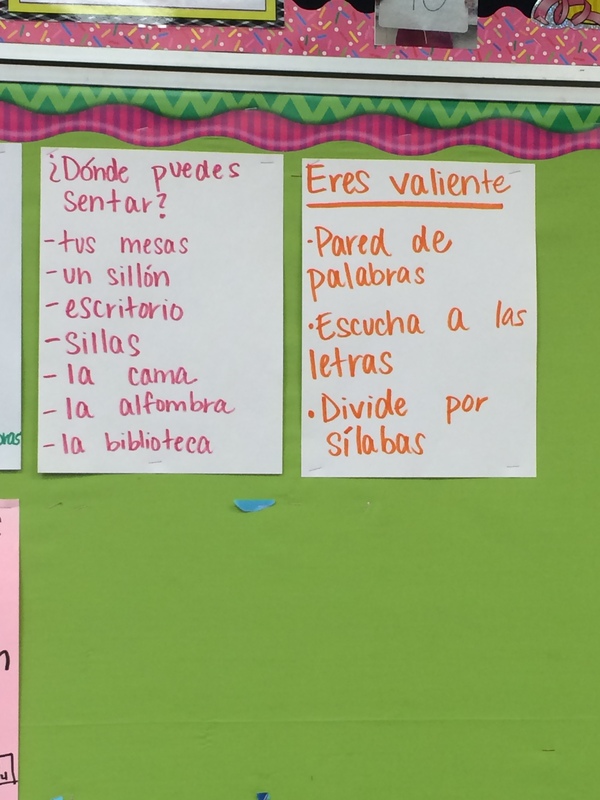 This chart comes from our 1st/2nd grade bilingual classroom. These kids were exploring places to write: the library, in bed, on the carpet, etc. 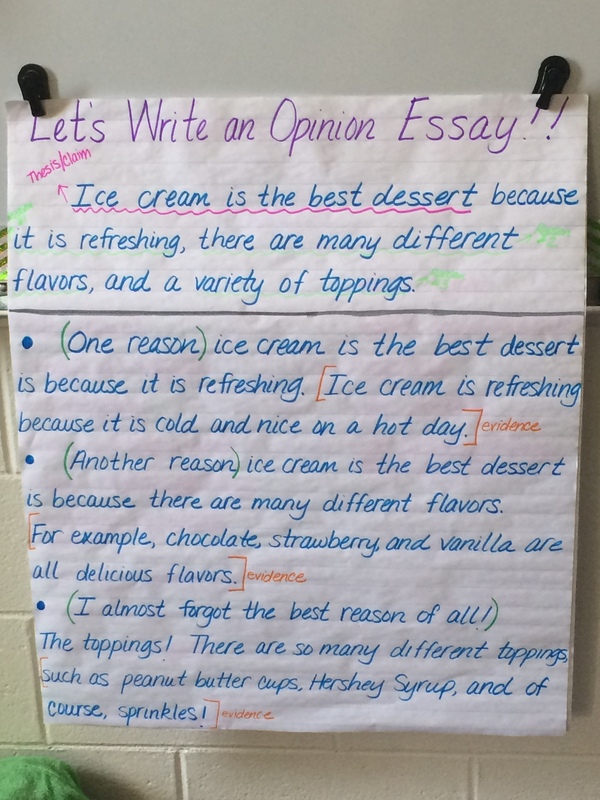 I smiled at this chart since it is evidence of modeled writing in the classroom. I love the annotations highlighting important parts of the essay. 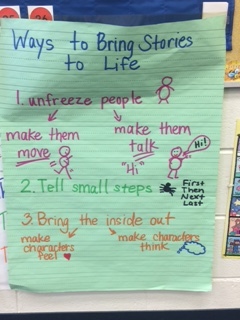 My favorite piece of advice from this first grade chart is to “unfreeze people.” I have to remember that myself when I am writing sometimes. I hope these charts confirmed some of your current teaching or nudged you to think in new ways. As I continue to ground myself in my new environment, I am comforted by the old, familiar feel of kids learning how to be writers. Unfreeze people…brilliant. I love the way these anchor charts speak to kids in their own language. I am so happy you took a walk, found all these GREAT CHARTS and you’re sharing them with us! I have jotted down SEVERAL teaching notes form these charts! It’s always so nice to peek into another classroom see their perspective, opens my mind and refreshes my teaching! It is always comforting to learn what other people are doing in their classrooms. The variety is endless…the ideas priceless. Thanks for taking us on this tour! Teachers rock!!! I love Terrie’s idea about putting anchor charts in SeeSaw! Brilliant! I must try that. This was a fantastic post. The charts are so helpful. 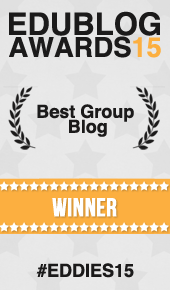 Thanks Dana! I’ve uploaded all of my anchor charts into Seesaw for the kids to pull up when they need them. I have created folders to help keep everything nice and orderly. My scholars seem to be enjoying them. I, too, like the tip about unfreezing people. However, the spelling chart that says “chop it out on your arm” might be my favorite tip. That’s so much better than clapping it out, isn’t it? Love these charts! 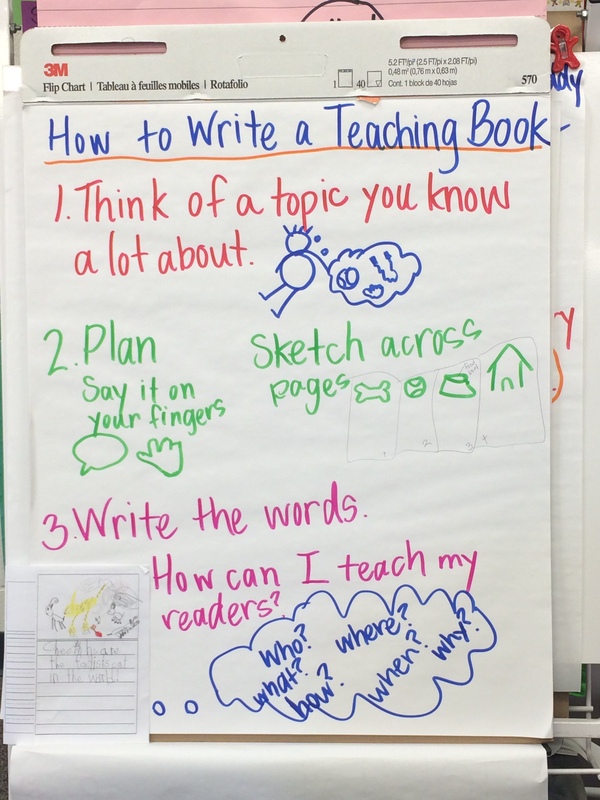 And you are so right, anchor charts ground our teaching and anchors our students’ learning – that is something that should never change! That right. Technology may come and go, but good anchor charts that are accessible will always be a necessity!